1. Traffic in the Bay Area is now as congested as it is in Los Angeles, the Chron reports, citing an annual survey. The survey showed that the Bay Area is now tied with LA for the second-worst traffic in the nation, behind Washington DC. Car commuters in the Bay Area and LA endure 61 hours a year of delays compared to 67 hours in the nation’s capital. Bay Area traffic is unusually bad on weekends and non-commute hours. 2. Toxic emissions in California increased in 2011, reversing annual declines since 2007, according to the EPA, the SacBee reports. 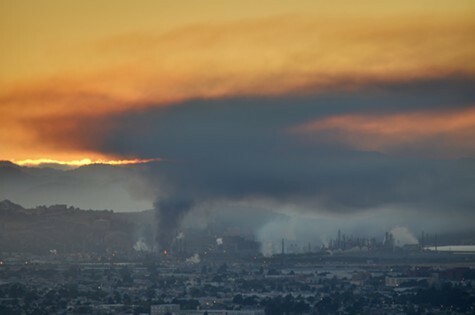 The EPA found that total pollution emissions rose 10 percent in 2011 compared to 2010. Nationwide, the amount of toxic emissions increased 8 percent. 3. All that traffic and pollution appears to be taking a toll on children, as the rate of asthma continues to rise in the Bay Area, particularly in the East Bay, the Trib reports. Nationwide, one in ten children now suffer from asthma, and the chronic disease is especially common among African-American kids. 4. State tax revenues were $4.3 billion higher in January than Governor Jerry Brown’s office had forecast, the SacBee reports, citing new data from the Controller’s Office. However, analysts are unsure as to whether the good economic news will continue or whether the jump in revenues was due to one-time gains. Sales tax revenue dropped 27 percent last month. 5. The state’s grape harvest was the largest ever in 2012, the SacBee reports. However, despite the bumper crop, grape prices rose sharply last year as the demand for California wines continues to increase. 6. And Pope Benedict XVI announced his retirement, citing his age and declining health. The last time a pope resigned from office was the year 1415.